My dear thanks to the couple that purchased this work for their new home. This particular oil wasn't easy but it wasn't made to be. 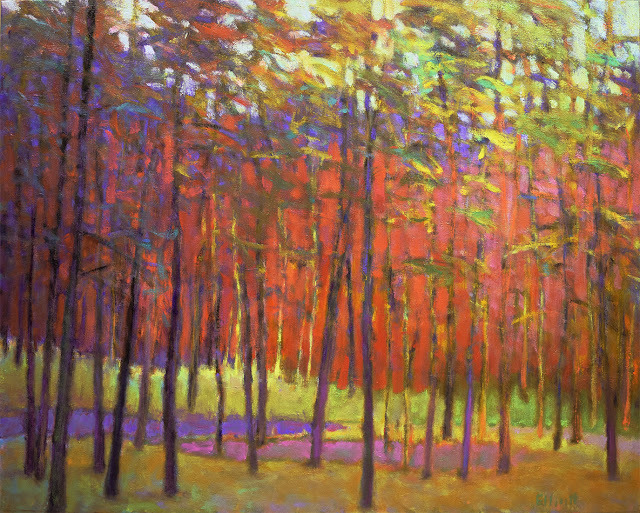 I wanted a row of red trees showing through a lattice of tree trunks and foliage. Simple enough, but many of these elements began to take on a 'need' for the light to filter through in various ways, leaving a lot of possible options. Another consideration presented itself: how much front to back depth should I allow? I went for a number of layers of depth in the foreground and out beyond the red trees. This was going to be a intricate forest, so how to keep it interesting? Complexities continued to be added but I kept to the idea of light illuminating that line of red trees. Knowing what the painting is about is very important. In this case, that knowledge kept me from getting lost in a convoluted forest. It took numerous sessions to complete, with the final two in the company of Terry, who flew in for private lessons. A lot of information was imparted with this oil as different colors and compositional elements were tried. It was a bit of a circus at times with all of the artful juggling, but an enjoyable process as all the elements finally found their optimal places and the painting was declared done. I am an event photographer, I love this event space Atlanta, and I will revisit this venue in a heartbeat. They have really great staff and pretty decent drinks. Their halls and rooms are absolutely gorgeous.